James Karrer is Principal Double bassist of the Tucson Symphony Orchestra, a position he has held since 1994, and Assistant Principal Bass of the Britt Festival Orchestra in Jacksonville, Oregon. 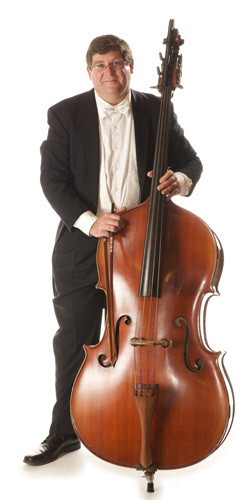 He has served as Principal Bass in Arizona Opera’s “Der Ring Des Nibelungen” orchestra, Acting Assistant Principal in the Colorado Symphony Orchestra, Principal Bass in the Aspen Chamber Orchestra and, at age 14, Principal Bass of the Central Ohio Symphony Orchestra. Mr. Karrer received both Bachelor’s and Master’s degrees in performance from The Juilliard School were he studied bass with Eugene Levinson and composition with David Diamond and Stanley Wolfe. As a soloist Mr. Karrer has performed Johann Baptist Vanhal’s and Frantisek Hertl’s Concertos for Double Bass, Bottesini’s duo Concerto “Passione Amoroso” with Gary Karr and the Tucson Symphony Orchestra, and the Shostakovich Adagio for Bass and String Orchestra for the Red Cross 9/11 benefit. As a jazz bassists, James Karrer was featured with cabaret performer Steve Ross on Holland American and Cunard cruises of Asia and the Pacific and the Schick/Karrer/Libman Trio at New York’s Metropolitan Museum of Art. Tucson audiences have heard Mr. Karrer in the rhythm section with singers Rosemary Clooney, Michael Feinstein, Dee Daniels, guitarist Dave Stryker and with local jazz greats John Ronstadt, Doug Martin, Susan Artemis, and Larry Redhouse. Chamber music performances include those with the Daystar Chamber Ensemble, Sky Island Chamber Musicians, the Tucson Symphony String Quintet, the Southwest String Quintet, the Ying Quartet, performances with Paul Zukovsky at NYC’s Museum of Modern Art’s Summer Garden, and the Sarasota Chamber Music Festival. Compositions by James Karrer have received performances in Tucson by pianist Angeline Ng, organist David Gay, and the Tucson Symphony String Quintet. How long have you played the bass? Funny musical experience: I once fell asleep playing Mendelssohn’s 4th Symphony in a concert (I had a 104 degree fever). Most exciting musical moment: Playing Bottesini’s “Passione Amoroso” with Gary Karr (concert soloist) and the TSO. If you hadn’t chosen a career in music, what else might you have done? I would have been a rocket scientist. Hobbies: I like hiking, bicycling and computers. Favorite composers: Bartok, Hindemith, Bach, Monteverdi, Gesualdo, Beethoven, Satie, Ravel, Mozart, Persichetti, Brahms. Hometown: Worthington, Ohio. My ancestors helped found it in 1803. Interesting personal fact: I rode my bike 150 miles with 10,000 feet of climbing in one day once.